In this leaflet you will find a presentation of our offering and more information on green charcoal. 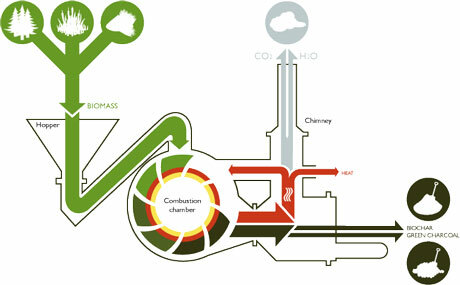 The furnace heats biomass to a high temperature under anaerobic conditions. The vegetable matter breaks down into green charcoal and gas. The gas is captured and burnt at very high temperature, thus neutralising its impact on the environment and producing the energy required to sustain the pyrolysis process. The PYRO-6G accepts all types of biomass: rice husks, coffee pulp, millet stalks, wheat straw, wild reeds, forestry waste, etc. However, throughput and yield varies according to the type of biomass processed. 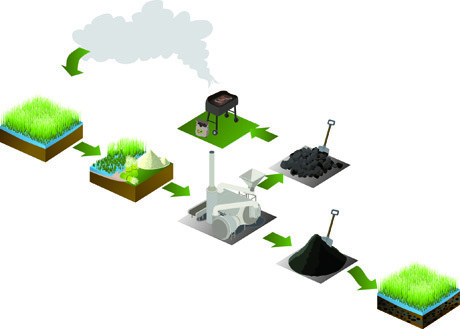 For example, the PYRO-6G can transform 500kg of rice husks into 200kg of Green Charcoal in one hour. The PYRO-6G was developed within the PRO-NATURA INTERNATIONAL NGO , which installed several units in Africa and, in 2002, won first prize for innovation from the Altran Foundation. 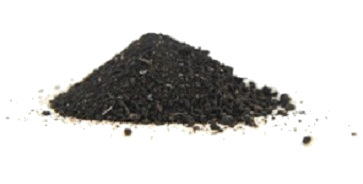 Since 2009, GREEN CHARCOAL INTERNATIONAL has continued the development and marketing of this technology. Please see our Leaflet for more information.